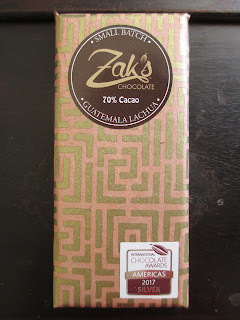 This will probably be my last review of Zak's Chocolate for a short while; usually I only do two, maybe three posts on one company at a time. So while there will be plenty more to taste later, for now I'm finishing off with the Guatemala Lachua 70% bar, which won Silver at the International Chocolate Awards this year. I was so pleased when I looked at those results this year and saw two Scottsdale companies (Zak's and Stone Grindz) represented there. Not that it's all about awards, but it's still nice to see your state having a significant presence in the chocolate world. This bar is wrapped up in the same style as the other, just with a lighter, sort of orange color instead of the red. And of course the little award sticker is there in the corner, nice and shiny. The flavor notes for this bar explain that it "exhibits initial citrus, then dried cherry and raisin notes." Compared with the Nicaragua bar, this chocolate has a fruitier scent. Mainly I would describe the first touch of flavor as silvery; that is, a sweet and mellow chocolate flavor with a smooth taste. Some fruitiness comes in next and just a hint of tang. Richness and warmth quickly follow in; that richness is what develops into the cherry/raisin notes, which become more distinguishable as the chocolate continues to melt. The finish leaves that flavor of chocolate warmth in your mouth. Occasionally, I might also get the barest touch of bitterness within that tangy, fruity flavor; to me, this is the citrus element. 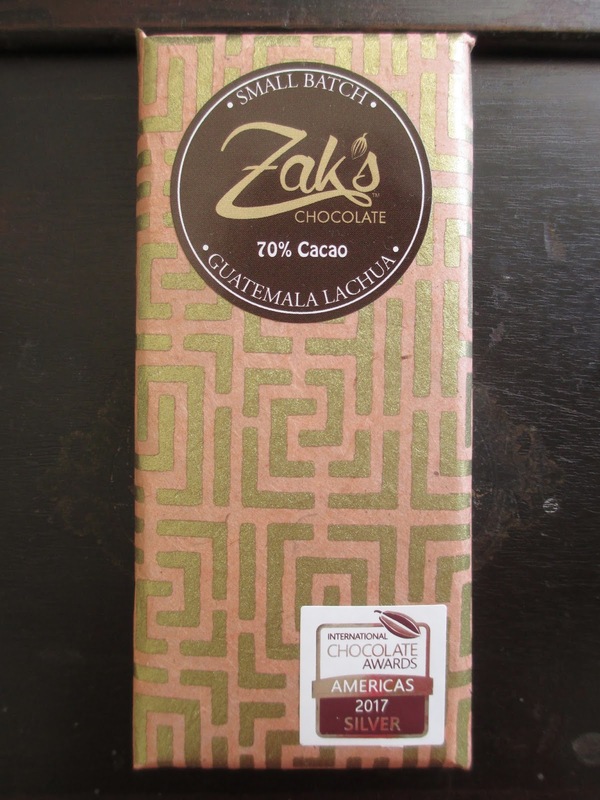 Funnily enough, the chocolate reminds me more of the Madagascar brownie than the Guatemala Lachua one. That brownie was deep and almost bitter; this chocolate is just nice and warm. And those fruity notes are very much reminiscent of the cherry notes from the Madagascar brownie--at least in my memory. This is excellent chocolate. It seems to hit a fine line where it isn't all about complicated flavor notes and yet it does have flavor notes. The situation here is what I want to call flavor-textured chocolate, or chocolate exhibiting flavor. The main flavor is chocolate, just angled a little this way or a little that way at different points. I find that, after all, I prefer the flavors here to those of the Nicaragua. And that's all I have to say. Another good example of successfully composed small batch, bean to bar chocolate.